Lost in the fan euphoria over the Cleveland Indians splitting a doubleheader with the New York Yankees on Monday is the fact that the Tribe offense was embarrassingly bad. One run over 18 innings of play? That’s all they can get with New York starting David Phelps and Vidal Nuno? And fans are supposed to be happy that the Tribe earned a split against a Yankee team that is playing without Derek Jeter, Alex Rodriguez, Curtis Granderson and Mark Teixeira? We don’t mean to come down hard on the Tribe, after all they have won 13 of their past 16 games and heading into Monday night were tied with Detroit for first place in the American League Central Division, but the offense has been downright baffling this year. Despite leading the American League in slugging percentage and OPS, being second in home runs and batting average, and third in on-base percentage, the Indians have somehow managed to score three or fewer runs 18 times through the first 37 games of the season. They have also scored just three runs in their last 25 innings of play and, if we’re being truthful here, are lucky to have won two of those three games. The Yankees are probably kicking themselves that they only earned a split; in four games against the Indians this year New York has outscored the good guys 32-8. 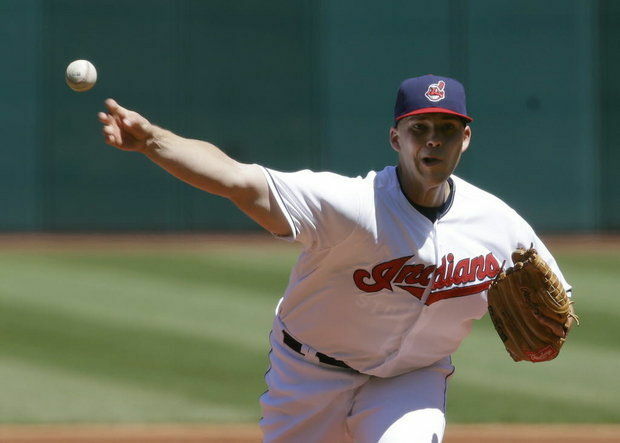 It took Justin Masterson throwing a complete game, four-hit shutout in the opener as the Tribe came out on top, 1-0. In the process, Masterson became the first Tribe pitcher to pitch a 1-0 shutout against the Yankees since Luis Tiant in 1966 (according to Stats LLC). That’s how close the Tribe came to being swept on the day. On the positive side, Trevor Bauer wasn’t as good as Masterson in the second game, but he wasn’t bad. In his third start of the season, Bauer allowed just two earned runs (three total) in 6.1 innings of work and only walked two (after walking 13 over 10 innings in his first two starts). If he can keep showing the kind of start-to-start improvement we’ve seen so far, he’s gone from seven walks in his first start to six and then two, he may be able to get off the Columbus shuttle and find a permanent spot in the Tribe rotation. Overall we’re not complaining, it is almost the middle of May and the Tribe is right there with Detroit for first place. With the opening on training camp for the Browns just a little more than two months away, the Indians just need to hold up there end of the bargain for another eight weeks or so. But if the offense has too many more days like today, we’re not sure the Tribe will be up to the task.